Hilaire-Germain-Edgar Degas. After the Bath, Woman drying herself, about 1890–5. Listen to author and painter, Anthea Callen talk about Dega's bather pastel series. 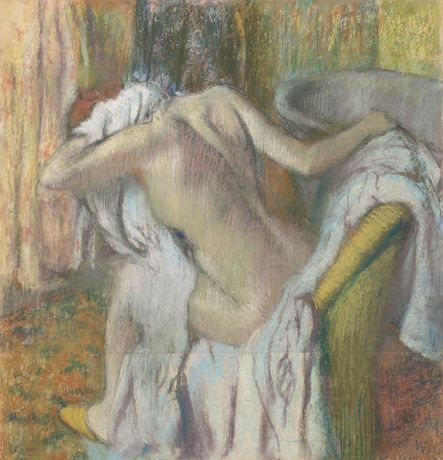 Anthea Callen will talk about Degas’s magnificent bather pastels series, and his related brothel monotypes, in the light of contemporary attitudes to sexual health, disease, dirt, and personal hygiene in Paris in the 1880s. A regular expert contributor on BBC1’s ‘Fake or Fortune’, Anthea Callen FRSA PhD is an author, scholar, and painter. She is Emeritus Professor of the Australian National University, Canberra and Emeritus Professor of Visual Culture at the University of Nottingham.